Authentic Thai food. Does that really exist in Vancouver? Well, I'm not about to tell you I've been to Thailand and blah blah blah blah. 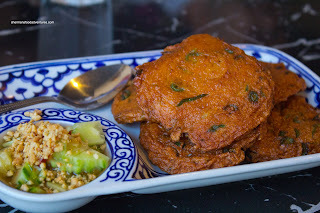 I haven't and I can only speak from experience and guidance from those who do know authentic Thai food. Let's take the Thai House for instance. That, my friends is not authentic Thai food. 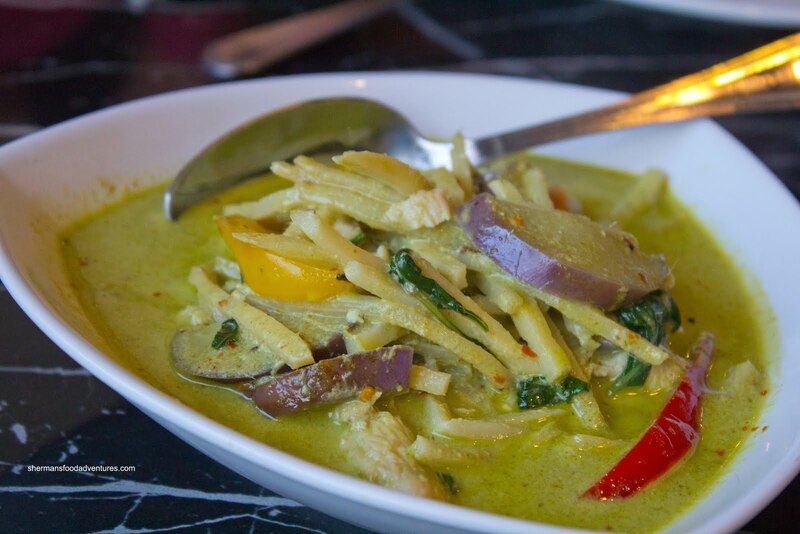 Yes, they do have Thai chefs and staff, but that doesn't mean they are serving what someone would eat in Thailand. And should they? Well no. That chain of restaurants didn't become successful by being stupid. As I have said over and over again, restaurants are out to make money. NOT to satisfy a select few people who slam them for their feeble attempt at authenticity. 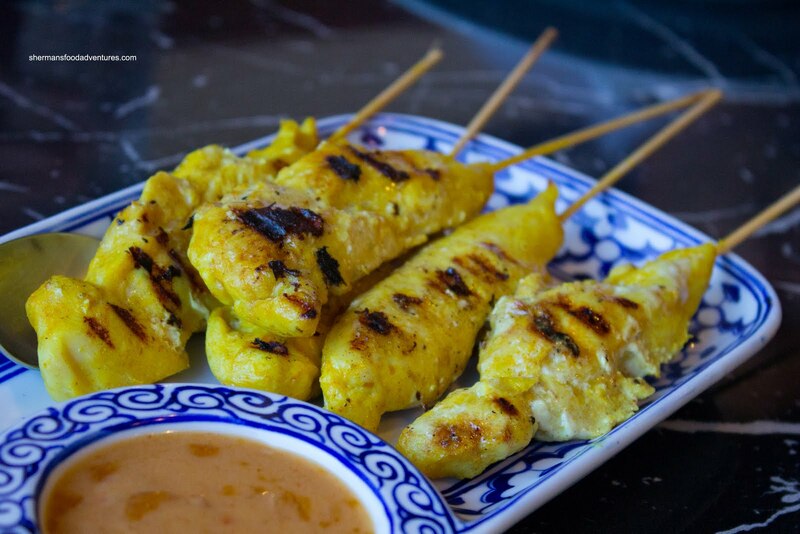 There are many that want mild, unoffensive Thai food, then Thai House will always have a clientele. Besides, does authentic always mean good? Absolutely not. I've been to my fair share of authentic food and it has been forgettable. If someone can't cook right, it doesn't matter if it is authentic or not (doesn't this sound like the rant from Penang post?). Well, Rich Guy, Viv, Herbie the Lovebug, Lana Banana and I were all in search of authentic Thai food at Aree Thai. Seeing how Herbie has eaten his fair share of South Asian food and Rich Guy hails from South Asia, we had some form of "authenticity" police present. To be frank, the meal didn't start off particularly well. The Chicken Satay was far too salty where it became the dominant flavour. 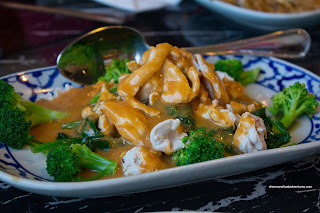 Even the sweet peanut sauce didn't do much to quell the stinging saltiness. On the other hand, the satay sticks were very meaty and not overly dry. Despite being slightly rubbery, the Fish Cakes were pretty good. There was definitely a fishy taste to them, in a good way though. Furthermore, there was a hit of lemongrass which was aromatic. 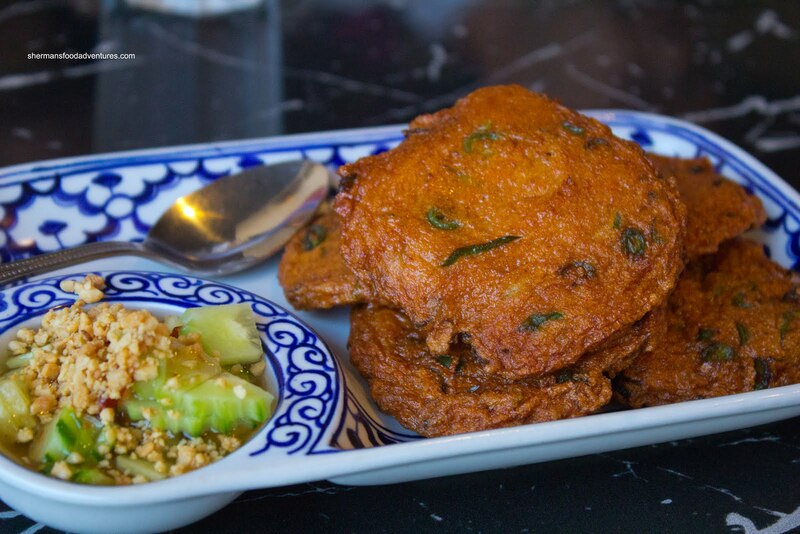 We really liked the accompanying cucumber dip consisting of crisp cucumbers, sweet chili sauce and ground peanuts. The one thing that stood out was the predominant fresh cucumber taste. Back to the topic of authenticity, there are actually 2 choices for Pad Thai: Original Pad Thai or Pad Thai with tomato sauce. 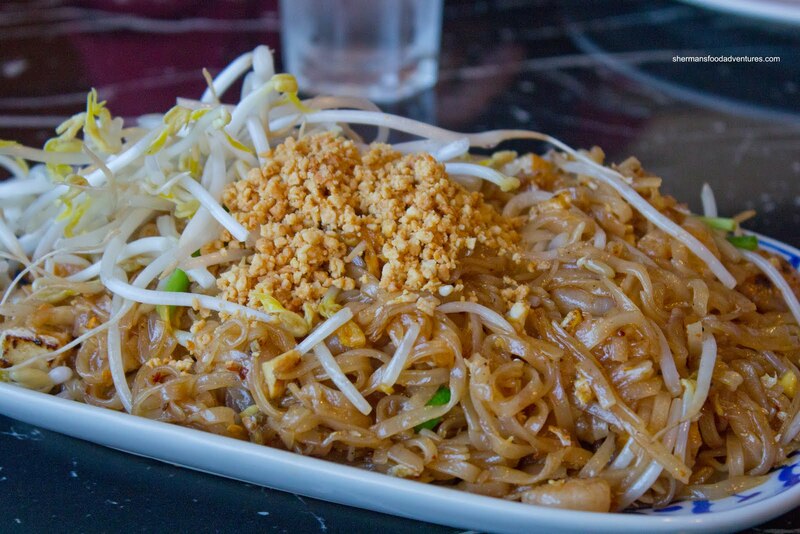 Naturally, we chose the Original Pad Thai prepared with tamarind. 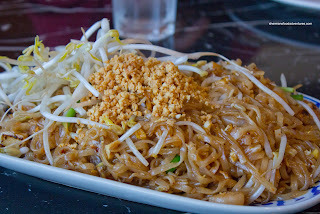 First and foremost, we were happy to see a version of Pad Thai without the use of ketchup and sweet chili sauce. Therefore, the flavour was pretty spot on with the natural sweetness and zing of the tamarind. Personally, I would've preferred a bit more spice. It was too bad that the noodles were on the softer side. Curiously, it was missing the normally present preserved turnip. By virtue of having it recently, Herbie the Lovebug suggested we try their Massaman Curry with beef. This was a pretty creamy curry due to the copious amount of coconut milk used. We had our curries prepared medium spicy and it did have a kick while not totally killing our taste buds (secretly, I would've preferred spicy though). For our second curry, we got the Chicken Green Curry. I really liked this a lot. The curry had a good consistency which was neither too thick nor runny. There was the usual coconut milk, but it wasn't overbearing. 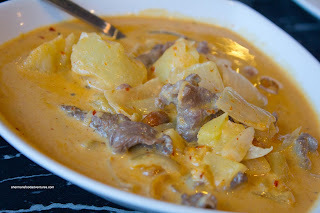 Much like the Massaman curry, there was some spice to it. With all of the components prepared correctly, this went well with the equally good coconut rice. Our next dish was not something I would normally order - Spinach with Peanut Sauce. Although the spinach was not overcooked while the chicken was still moist, the overly sweet peanut sauce made this dish taste like some weird rendition of spinach gomae. Lastly, we had the Goong Ob Woon Sen or shrimp with glass noodles in garlic sauce. 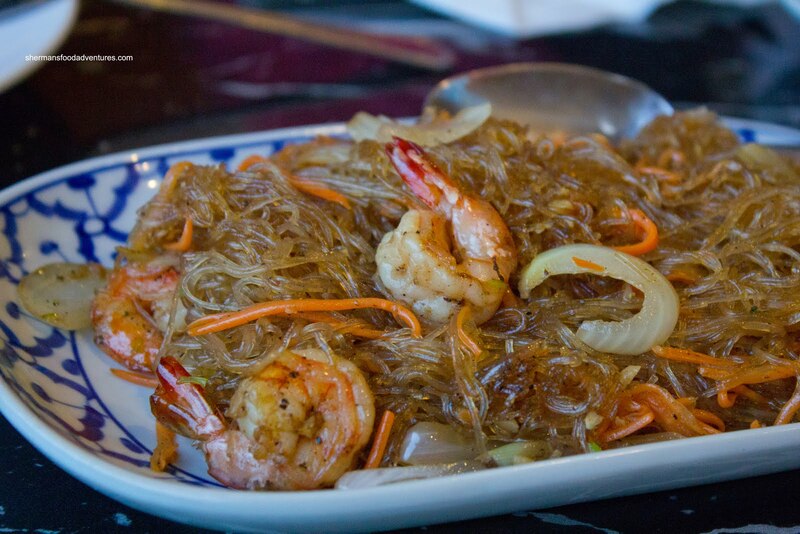 The dish itself was cooked perfectly with snappy shrimp, crisp veggies and chewy al dente mung bean noodles. Flavourwise, they were far too aggressive with the salt. After eating this dish, I was super thirsty, as with the others. The menu clearly states that they do not use MSG, so we can only assume it was too much salt. So was this an authentic Thai meal? Well it depends what you consider as authentic. Does it have to be super spicy? Well it was spicy, but by virtue of our choice of medium, we'd never know right? Besides, just like any other form of cuisine, every dish is up to the interpretation of the chef. In this case, there were some winners (the curries, fish cake and pad Thai) and some "meh" items (satay, spinach and glass noodles). 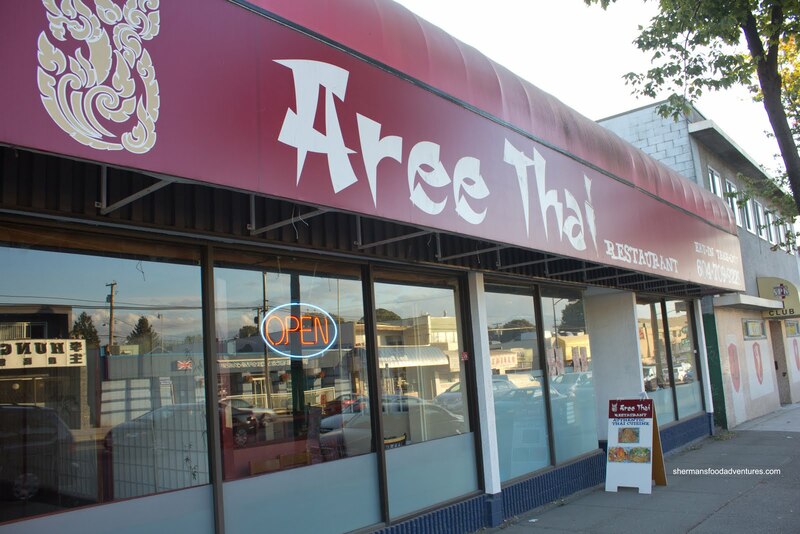 So where does it put Aree Thai? Well, if you order the right dishes, it can be a solid experience.